A new wave of tech innovations promises to make it easier for companies to find internal talent. When a new millennium arrived and the Internet became pervasive in the modern workplace, it didn’t take long for online entrepreneurs to realize there was a huge and lucrative potential market in tempting the employee of the 21st century with greener pastures at a different job. Beginning with online job boards and progressing quickly to the all-encompassing LinkedIn — which, following its launch in early 2002, evolved into a kind of online dating service for restless executives who posted their resumes and connected instantly with outside recruiters — the Internet has surely helped spur a sharp decline in workers’ loyalty to one company. That’s why it’s surprising that top corporations waited so long to realize they needed to build their own social networks — promoting career pathways and outside-the-box yet enticing job opportunities in-house, and not at some competitor down the road. “We were looking at the HR landscape and we realized that — especially in a world dominated by LinkedIn and Indeed and CareerBuilder and all these external job-hunting sites — your employees are finding it really easy to step out the door tomorrow, and yet companies aren’t being competitive with their own internal resources,” says Joseph Quan, founder of a New York-based start-up called Twine Labs, which produces a tool designed to help HR executives widen their pool of internal job applicants. Quan and Twine Labs are part of a new, if belated, movement to bring the allure of LinkedIn to the company intranet, to excite workers about internal job openings or help human resource executives identify promising candidates to entice for those jobs — with the broader goal of helping to convince ambitious and restless millennials that when it comes to career advancement, there’s no place like home. Quan — who soured on a promising career in Silicon Valley and left to earn an MBA at the University of Pennsylvania’s Wharton School — knows his generation’s dilemma first-hand. While still a student at Wharton, he teamed with classmate Nikhil Srivastava to develop an app initially intended to help other students, and possibly workers at large companies, find others with common interests. 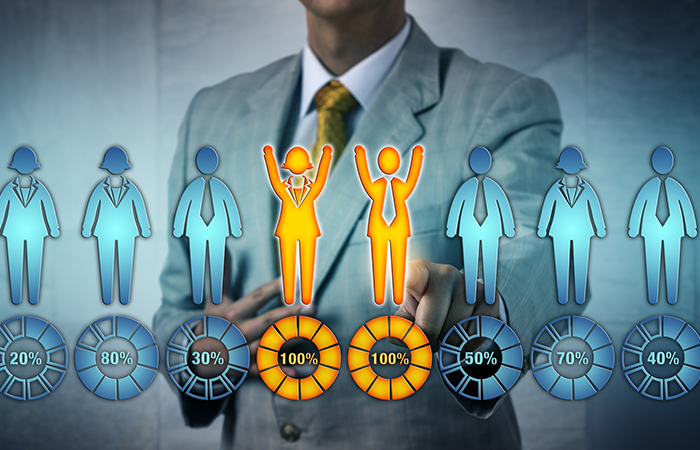 But when the two entrepreneurs showed their technology to business executives, they learned that what companies really wanted was a tool to help make the internal hiring process better and more dynamic by broadening the pool of candidates for key promotions. “People who move around [within a firm] usually stay longer — not just because of the pay bump but they’re more fulfilled and getting more exposure across the company,” says Quan, whose Twine Labs had already connected with top firms such as Nielsen Holdings, the entertainment rating company, even before he and Srivastava earned their MBA degrees this spring. It’s not hard to understand why there’s sudden demand for any solution that would improve the internal mobility process — the trend of young executive company-hopping talent not only drains the pool of future C-suite leaders but costs countless millions in recruiting and training costs for replacements. Most experts believe today’s high-potential employees are more prone to hop between companies in the search for career fulfillment, especially at the dawn of their career. One recent study — ironically, by LinkedIn — found that while people who graduated high school between 1986 and 1990 worked for an average of 1.6 companies in the five years after they graduated, that number had doubled to 2.85 firms for those who graduated between 2006 and 2010. Few believe that Internet job sites are completely to blame, but most agree it’s a factor. Even as most companies eagerly lure rising talent from the outside, there’s a growing awareness of the benefits of grooming future leaders from within. Money is a big part of that — some experts suggest it costs as much as $40,000 to bring in a new executive and train her in her new environs — but there are other intangibles, not least of which is a growing awareness that rising executives who feel they’re doing exciting things and learning new skills en route to the C-suite are happier and more productive than those who spend their afternoons job hunting on their laptop. “This is an unsolved problem where we didn’t have the right technology,” says Josh Bersin, the founder of Deloitte Consulting LLC’s Bersin by Deloitte unit, based in Oakland, Calif. Bersin tells the story of one client, a large U.S. health insurer, that recently complained about losing the head of one of its largest business units to a rival across the street after the competitor dangled the same job he would have earned, albeit in two or three years, had he stayed. The goal now, Bersin says, is finding ways to make rising business leaders feel they have more control over mapping a career path. That sounds relatively easy, but Bersin and other experts note there are deep institutional barriers to making internal hiring more open and democratic. The idea of using Big Data and technology to identify internal jobs candidates — sometimes from unlikely units of the company, or even overseas — is highly disruptive to the so-called “old boy networks” that historically held sway. Conversely, managers may be reluctant to easily let their top performers leave for a different department. Officials at tech giant IBM acknowledge facing steep cultural resistance when they laid the groundwork for the 2015 launch of its computer-based internal-mobility effort called Blue Matching, a play on the firm’s long-time nickname of “Big Blue.” They say they convinced managers that it’s better to lose a valued employee to another IBM unit than to an outside competitor, and that they’d be gaining some desirable transfers from inside the company, not just losing their favored underlings. Anshul Sheopuri, an IBM Distinguished Engineer and director of people analytics and cognitive offerings, says that the key goal in designing Blue Matching was to develop a function that would empower employees and use state-of-the-art data about workers’ resume, passions and abilities to recommend job openings, which occur frequently in an international behemoth that employs 380,000 people. “Often, they may not know whether a job is the right fit,” says Sheopuri, so the algorithm aims to encourage employees to take more risks, to possibly pursue choices in other areas of Armonk, N.Y.-based IBM. The program is something of a logical step for the pioneering computer firm, since Blue Matching is a kind of a calling card for Watson, its cognitive computing system that combines Big Data with advanced reasoning to make informed recommendations, even intuiting skills that a worker might not have listed on his or her initial job application. IBM officials say that despite the initial resistance, Blue Matching has been a success in its two-year run, with more than 1,000 employees finding jobs through the program and its participants three times more likely to apply for an internal position than non-participants. Nevertheless, Sheopuri says, the operators of Blue Matching are constantly striving to make the program more employee-friendly — surveying participants, for example, to learn if they want to receive job listings monthly, or weekly, or even more frequently. “A lot of people wanted more functionality,” Sheopuri says. Much of the new wave of HR technology targeting internal mobility — whether from big corporations such as IBM or a small handful of boutique start-ups — focuses on one of two approaches: Either helping employees chart their career course or aiding HR leaders by generating lists of candidates from across the firm when an opening arises. That second approach is the strategy adapted by Twine Labs, which uses its algorithm to generate lists of internal candidates that are sent to hiring managers. The start-up’s pitch to potential clients, Quan says, is that firms are spending plenty of money on training and development but aren’t mining the available data to find a strong internal candidate who might be at the other end of the hall. A rival HR tech start-up called Fuel 50, founded by New Zealand native Anne Fulton, is more like IBM’s Blue Matching in that its program is more employee-facing. Fulton, whose original background is in organizational psychology, says her outfit had once been focused on developing career-coaching solutions when a large U.S.-based global bank approached her, asking for a tech-oriented solution for keeping its executives from jumping ship. “That was our pivot moment,” Fulton says, as the Los Angeles-based firm worked to develop what it now calls “a career-pathing solution” that she also describes, with a laugh, as “LinkedIn meets Match.com” by going beyond skills to weigh other factors such as ethics values in matching workers with available in-house jobs. “Transparency around opportunities is what people are hungry for,” Fulton adds, particularly in a world where the Internet had made it so much easier to see what outside positions were available than what they could do internally. “And organizations … they want employees who will think outside the square” of what she called “positional career thinking,” or starting in one business unit of a company and staying there. Increasingly, large companies such as AXA, the French global insurer with a sizable presence in the U.S., are looking to design systems that will keep workers — especially milliennials who came of age drenched in social media — more engaged on a future that involves staying with the same letterhead. Nicole Hazard, director of people analytics for AXA U.S., says the insurance company has increasingly turned to Big Data to help solve human resource issues such as employee engagement but now was looking to address a growing problem with retaining executives, at a time when the average tenure had shrunk to just three to four years. “We wanted people to stay at AXA,” Hazard says, “but have many jobs within the company” — with the idea that rising executives with diverse experience will be good for the firm as well as the executive. AXA worked with an existing vendor — Knack, which uses video games and other mobile tools primarily to assess talent — to develop new programs more geared toward connecting workers with in-house job opportunities and charting an ambitious career path. Currently, Hazard says, the firm is working to stretch the tool’s ability to be more intuitive about a new hire’s hidden strengths not listed on his or her resume, with the hopes that both the employee and his or her bosses will see more career options than they do now. What’s next? Forward-looking thinkers like Deloitte’s Bersin and Fuel50’s Fulton say that the current wave — seen as something of a belated reaction to LinkedIn’s successful format — may soon be augmented, if not supplanted, by in-house computer apps modelled after an iconic tech start-up of the 2010s — Uber. Experts say that the gig economy — which allows workers to take on short-term or part-time jobs — could also disrupt the modern office by, for example, giving employees the opportunity to bid on one-off projects within the company as a way to gain a new skill or perhaps develop new ties with colleagues in a completely different section of the firm. “In the future, we’ve got to move beyond job titles and think about experiences and projects and stretch gigs, to think about building the marketplace,” Fulton says, when asked about the next frontier for internal mobility software. For HR leaders pondering a tech-driven transformation, an upcoming session at the HR Tech Conference will offer specific steps to success. Josh Bersin offers up ways to address employees' new mindset through total rewards.